Powered by the 2.4 GHz wireless X system, this Godox AD600Pro Witstro Flash and XProC Wireless Trigger Kit by B&H pairs the AD600Pro 600Ws portable monolight with the XProC flash trigger for Canon cameras. Together, they allow you to remotely trigger your flash at distances of up to 328' while using Canon's E-TTL / E-TTL II system for exposure. Box Dimensions (LxWxH) 12.75 x 9.5 x 8.0"
AD600Pro Witstro Flash and Canon Wireless Trigger for Canon Cameras Kit is rated 3.8 out of 5 by 5. Rated 3 out of 5 by Parian from Improvements? I was under the impression (by all the paid reviewers) that the new Pro had certain improvements that upgraded it from the AD600. I have only shot once with the lights so I am still trying them out. Well the metal handle that is supposed to be such an improvement can't even hold an umbrella in place for very long, every few minutes we had to stop and readjust everything to make sure the lights were in place. The batteries ran out half way through my shoot, so I would recommend a back up set (we had to recharge during lunch). The color of the lights may be consistent, but they are running too red. Otherwise I like the convenience of the mono-light. I gave it a three star because the misinformation that was spread about how effective the pro was over the original AD600 particularly about the "metal" versus the plastic handle with the grooved movement. Why not a metal handle with the grooved movement to keep the handle locked? Rated 5 out of 5 by Cameron from Love the pro! I'm a headshot photog and was looking for a new system that would allow me to create a 'wall of light' by shooting through an 8 x diffusion frame. I took a chance on this strobe after hearing so many good things and I have not been disappointed. This thing packs a serious punch and the build quality is fantastic! Easy menu system, synced up right away to my godox flash trigger, and was shooting within an hour of opening the box. It's amazing! Rated 5 out of 5 by Analytics from Great flash, Easy to setup and use I'm?by no mean any expect when it comes to flash strobe?lights. I did a lot of research and found this to fit my budget and liked the specs.? I used it a hand full of times and it just works. Simple to setup and nice the have the TTL option with overwrite. .. Rated 4 out of 5 by TL from A big step up! 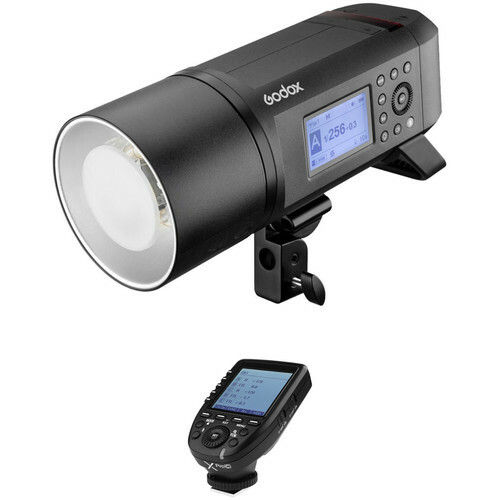 I got this for portability and to upgrade from my old interfit 200xd monolight. I've done a few test and can't wait for the first outdoor shoot. Can i use this together with canon Flashes at the same time? If the Canon flashes have a Godox X1R-C TTL Wireless Flash Trigger Receiver for Canon B&amp;H # GOX1RC , they can be fired along side this monolight. When are they expected to be in stock? Can I fires Godox AD600Pro with Canon ST-E3 RT? Do you know if the trigger will fire the Rovelight 600 series of lights? Or would I need to go to a 3rd party trigger system? Yes, one light and one transmitter. Im loving mine so far. Nice build quality and the exposures/color have been spot on. Can this work with a quantum trio on a canon camera ? What kind of soft box can I add to it? Any softbox with a Bowens mount, the sky is the limit.